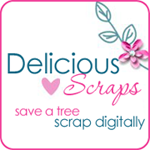 Delicious Scraps: "Spring Love" QP and DOLLAR SALE continues!! "Spring Love" QP and DOLLAR SALE continues!! MY GRAND OPENING DOLLAR SALE CONTINUES THROUGHOUT THIS WEEKEND!!! This is a QP from my Upcoming kit called "Spring Love". It is available for free from my store for a limited time only!! Click on the image to get it! Hello very nice your blog, if you like the scrapbooking you can visit the blog dedicated to scrap full of free resources! A greeting and good day! Thank you so much for this Freebie. I want to let you know that I posted a link to your blog in Creative Busy Hands Scrapbook Freebies Search List, under the Quick Page(s) post on Jan. 31, 2009. Thanks again. Very pretty, Thank you very much. Warm thoughts from Corrine in Wa. thank you for very nice Spring Love QP , but 24 Mb ... that's quite heavy for d/l : tagger size is more easy to manipulate & who needs 300 dpi 12x12 ?